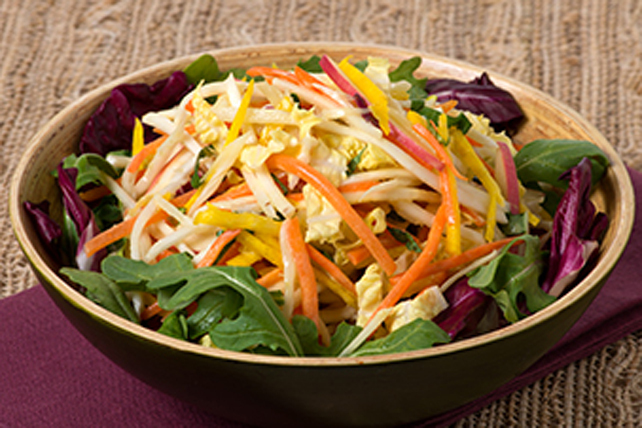 With just a little effort and some out-of-the-box ingredients, coleslaw becomes a little more upscale and extraordinary. Toss arugula with radicchio in medium bowl. Combine remaining ingredients; spoon over arugula mixture. Prepare using red beets and/or substituting pears for the apples. Or omit one of the suggested vegetables and double the measure of one of the other vegetables. Add 2 Tbsp. chopped fresh basil or mint to the salad. This colourful recipe can easily be doubled or tripled to make 4 or 6 servings.